This weekend, we are running a competition in association with new online clothing brand Naeco. If you are heading off to the beach this Christmas, it is one for you. Two Head for Points readers will each win a luxury pair of swim shorts made from recycled plastic, worth up to £220. Plastic is a big problem the earth facing and it’s not going to solve itself. The proposed UK ban on plastic straws was a great start, but we do have to do more. A number of companies are tackling the plastic problem by finding ways of reusing plastic and turning it into something new. One of these companies is Naeco who turn plastic bottles into luxury swim shorts. Two lucky Head for Points readers can each win a pair from their current collection. Naeeco is a British clothing company that produces all its items in London using plastic bottles as the raw material. 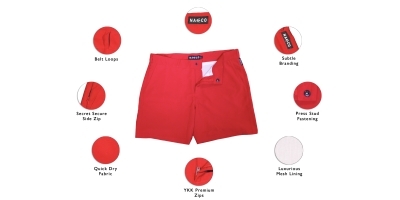 Each pair of Naeco swim shorts is made from 15 plastic bottles. This month their goal is to remove 15,000 plastic bottles from our oceans and landfills. Our aim is simple; to create a luxury brand that shows the world that there is no need to carelessly use our worlds natural resources. We can make clothing from sustainable materials that have a positive impact on our planet. We take plastic from the ocean and give it a new life as soft luxurious fabric. These are no ordinary swim shorts – these are the best quality swim short we could produce. Our fabric is made from an average of 12 plastic bottles that go through our unique process to make the fabric soft, durable and sustainable. Our master craftsmen use traditional British tailoring techniques to make the finest swim shorts on the market. You won’t find quality like this for the same price point. Every stitch and piece is expertly put together to give maximum comfort and durability. These are the chinos of the ocean – soft, comfortable and made for life. Two HFP readers will each win one pair of swim shorts – you can pick the colour and of course the size – from Naeco worth up to £220. As always, all you have to do to enter this competition is fill out the Gleam widget at the bottom of this page with your name and email address. You receive a 2nd entry if you tick the box to sign up to Naeco’s monthly email newsletter. A good reason to do this – apart from increasing your chances of winning – is that, once the competition has closed, Naeco will email you a 20% discount code valid for 60 days – hopefully just in time for Christmas. You need to enter by midnight on Sunday 16th December. The formal version of the rules is in the widget below if you click ‘Terms & Conditions’. If you can’t see the Gleam widget below click here to be taken to the special entry page. We use a company called Gleam to manage our competitions. By entering, you are submitting data to Gleam, acting as Data Processor, and not to Head for Points, acting as Data Controller. On top of the data you provide on the entry form, we collect the time, date and location of your entry. Your data is held in the USA in an EU Privacy Shield-compliant facility. Your data is used only for the purposes of running the competition. It is not used for any other purposes and, apart from a ‘thank you for entering’ email confirmation, you will not receive any other communication from Gleam or Head for Points unless you win. Some competitions may give you additional chances to win if you follow a company on social media or agree to join their mailing list. These choices are always optional and do not impact your ability to enter the competition. Either you’re confusing them with swim nappies or you have too much money! At the risk of sounding ungrateful but as a long term reader, am I the only one that finds this a bizzarre feature? No, there were several competition offering clothing since the beginning of the site. There was one for shirts last year at this time. Swim shorts are at least linked to holidays, so not that bizarre. Cam swim shorts really be worth £220 ?? Priced at £220, selling successfully at £220, perhaps, but ‘worth’ £220 !!!!! Thanks for the comment – I am reading through them personally as this competition progresses. Hopefully, I can help with this question. I will do my best. The first thing to remember is that our product sits in the luxury category and is priced directly in line with other brands in this sector. The quality of the craftsmanship and the final product is not what you would expect on the high street. We are more the Saville row suit vs high street suit – we always offer free shipping and returns so you can see this for yourself with no obligation to keep them. The second thing to remember is we are a sustainable brand that pays UK living wages, reinvests in our global environment and uses sustainable low impact materials. All of these factors do increase the cost of goods for us but does make for a brand of the future. A brand we are proud of and a brand with high ethics, values and standards. This is something our customers are also proud of when wearing Naeco products. – Our fabric is ethically and sustainably sourced and produced. We ensure we know that everyone in the supply chain has been treated with respect and fair and ethical working conditions. – We source our materials from suppliers who share our philosophy. – We make our shorts with no (or as little as we can) compromise on quality, ethics or sustainability, and we constantly invest back into these areas. – We invest in research into new, sustainable materials to reduce the landfill footprint globally. Every pair of our shorts removes 15 plastic bottles from landfill and our oceans. – Our products are handmade by master craftsmen and take 2-3 hours to make every pair. Every stitch is thought about and every detail is added by hand to ensure the highest quality finish that you rarely see in swimwear. – Finally, we guarantee our products for 5 years ensuring we deliver superior quality and service. We will fix and repair any product that has defected during this time ensuring you don’t contribute to landfill and pollution. We are on a constant journey to improve every aspect of our business; from the designs and colours, to sustainable materials, construction, durability, repairability, messaging and marketing, supply chain speed and customer service. We have continuous improvement programs to bring you a consistent and delightful supply of the most sustainable and well-constructed shorts, and the planet. Ultimately, we aim to provide the very best value to ‘you’ (our customers) creating a premium and sustainable product; good for you and the planet. – Cost-per-wear always makes investing in quality over quantity worthwhile! – Sustainability should be a priority, not an afterthought. I know it is a long reply but I do like to ensure people are informed and I give you and your comment the time it deserves. I hope this has helped to understand our pricing model and how we create our garments at Naeco. We would love to have you as part of the Naeco journey so please reach out with any questions you may have in the future. Pay £220 for a pair of shorts and become part of the elite save the world club? Please stop, newsflash, stop buying products that use plastic as packaging. I Have not even a bin full of plastic and carton per quarter of a year at late. That is making a difference. I want to make a difference, you want to make a killing…..I have news for you: Its not gonna work, as per Peter Jones” I will not be investing) I do however have my popcorn (on a 5 quid non plastic plate) o my knee, as this is a most enjoyable read to finish the working week! Head for Swim Shorts anyone? My wife says for that price I had better get the models body too. I suppose 12 bottles go into small size and 15 into extra large? Whilst i sympathise with the concept of reducing plastic, isnt the UK banning plastic straws rather like us turning up to a tsunami site with a dust pan and brush?!! £220 for a pair of swimming trunks?? Even my posh ones from the signature turtle emblem people with the label on the back dont cost that much!! Paper straws have a much higher carbon footprint in production, so there is a risk to the change. Doing without is probably best, and great for the dental industry! But paper does bio-degrade satisfactorily, when not recycled, but these synthetic polymers do not – they just degrade into smaller and smaller bits. Yes, they will finally decompose, but we are talking many hundreds of years before that happens. The thing with recycling is that most people don’t understand it. Take paper. Virgin paper used here most likely comes from renewable forests in Scandinavia and the manufacturing process is powered by hydro electricity which clearly has no emissions. When you throw your newspaper in for recycling, it is recycled in the UK using a very energy-intensive process which – due to UK electricity production – will use the remaining coal fired generation capacity and, after that, gas. Over the whole life cycle, not recycling paper in the UK may actually be better. Absolutely, I’m not advocating one over the other. Just the that the choice isn’t as clear cut as it is often presented. Hi Nigel, thanks for the comments. Your pretty spot on 12-15 bottles depends on the size of the shorts. I agree our price point is in the luxury bracket but we make everything here in the UK to ensure quality but also fair and ethical working conditions and contributing back into the British textile and manufacturing industry. Each pair of our shorts takes 2-3 hours to make and this level of care and attention is part of what you would be paying for. I fully appreciate these are not for everyone but if you ever want to see them being made please do reach out. Thanks for the comments and joining the debate! Now I have read it all ” every stitch is handcrafted for your comfort”….. never have I ever stood in a swimming pool thinking ” something is wrong with the stitches of my trunks here!”…. honestly some people! Handstitching is more effective than machine stitching – you should read some tailoring blogs, try Permanent Style for starters. The second machine stitching starts to fail, you have a catastrophic failure. Hand stitching is much more robust. “you should read some tailoring blogs” – I can think of several billion things I’d rather do before I read a tailoring blog! Perhaps this is where you’re going wrong Callum? Perhaps spending a bit more time researching and appreciating genuine craftsmanship would add some richness to your life. Ermmmmmmm, no. I’m not remotely materialistic (no pun intended), and while I wouldn’t go as far as to say I’m proud of it, it’s certainly not something I want to change. Ok so I read some of this blog, and still I will not spend a household shopping budget for a month on a pair of shorts! A lot of corporate drivel and a link to a blog is not going to change my mind! I am definitely not trying to persuade you to become a customer. I just thought I would join the conversation personally so people could get answers if they wanted them. I know this industry quite well and really take an interest in everyone’s opinions. I wanted to fairly answer questions. I dont think I have given corporate drivel at all, I apologise if you feel that way as that is not how I think we come across. I answered passionately about an issue I am keen to fix. I have explained price points, manufacturing prices etc for anyone interested that’s all. I find it a really interesting debate. I’m glad you did. Personally I’d never spend that amount on an individual item of clothing (except for perhaps specialist items like a ski jacket) I appreciate there’s plenty that would and also found it interesting hearing about what you’re doing! Haha agreed, you may not have thought it at all – when we designed them we just wanted to take care in making them so they lasted the test of time. I am a kitesurfer and put my shorts through their paces – but they also put me through my paces after wearing them for 8 hours on the water I found even top brands to not be as comfortable. That’s why I designed them with sport in mind mixed with European style. It was the small details like the internal elastic on your legs – this chafes in some brands and was something we avoided using by making our mesh lining stretchy which removed the need for this. Really appreciate the feedback though! Am I the only one that thought this was a good thing? I can’t be the only HfP reader who’s had to stop swimming (repeatedly) to peel a plastic bag off her arm in the Andaman Sea? I’m all for anything that reduces the number of plastic bags and increases the number of turtles! Absolutely a good thing but I don’t know anyone who would pay £220 for swim shorts! They’re going to get dunked in salt water, sand and sun cream for starters. … and after a few thousand years of salt water, sand and suncream, they might actually start to break down! Synthetic fabrics tend to be quite durable. I have several pairs of hiking trousers made from various synthetic fibres, they’ve been put through the paces pretty thoroughly many, many times, and the only pair I’ve ever had to chuck were the ones I destroyed by slipping on a scree slope on a volcano in Guatemala, landing on hot rocks below (my guide didn’t tell me that the scree slope was sitting on top of a lava flow…), and the shorts melting. Saying that, I wouldn’t pay £220 for the swimming shorts either, but I’m clearly not their target market. Nice to come across someone else who has walked up an erupting volcano in Guatemala – only on HfP, I would think! Which volcano were you on? We were just on the lower slopes of Agua, grass, not scree, but at night, so that you could see the red-hot rocks coming down the hill towards us. In retrospect we must have been completely mad. It was Pacaya I think, back in 2009. We hiked up to see a lava flow, but had to hike across another lava flow (covered in scree) to get to it. Madness, but then again hindsight is always that perfect 20:20 vision that otherwise eludes me! Luckily the synthetic fabric melted and shrunk in on itself, rather than melting on to my skin! I did have some pretty bad blisters though, and had to fly back the following day on Iberia Economy. Sitting down. All day long. I’ve never tried so desperately for an upgrade in my life! Your correct we do use bottles – bags not so much in our fabric but do make up a small percentage. Bottles, fishing nets make up the majority and these are actually collected from specific ocean areas. We really are removing them from oceans and not just stopping them at landfill. Unfortunately, 8 million tons of plastic goes into the ocean and was the reason I set out to make a product form it. It is a long journey and we currently only make shorts but who knows what the future might bring. We use bottles in our marketing as it is easier for a consumer to identify with rather than giving metric metres of garbage removed. I hope that helps. Thanks for joining the conversation. Cat, you’ll probababy be happy to hear that the Thai National Parks Authority have banned tourists from Maya Bay, and due to success of this they are now considering similar in other islands and marine reserves that fall within the Parks. The problem is not solelly tourism though, much of the blame resides with Thais too. Part of the problem is sheer tourist numbers, as well as tourists who are a bit ignorant of the environmental problems they create. I remember one Selfies-in-the-Sunset obsessed group of Korean ladies in the Gobi desert – we were doing the same circuit at the same time, and for a week, they refused to use the long-drop toilets in the ger camps, and we would encounter their solid and cotton-wool based waste 30m from our tents in the morning, as well as toilet paper and wet wipes blowing in the breeze. A whole world of ewwwwwwwwww. Saying that, I suspect the vast majority of the plastic straws in the Andaman Sea and the Gulf of Thailand come from the buckets of European and N American tourists at full moon parties. I remember Hat Rin Bay at dawn being just plastic straws and slightly yellow-tinged sea as far as the eye could see. More ewwwwwwwwww. Hi Cat, thanks for the positive feedback. Really appreciate it. We predominantly use bottles, straws and fishing nets in our fabric construction but bags do play a percentage. This is due to the nature of the fabric we are producing – we need it to be long-lasting and durable. P.S your trip sounds incredible… very jealous! The Louis Vuitton and Hermes tshirts I wear on holiday were well above that, I think. I can’t be bothered to find the quote but it was barely a week ago (in a Centurion discussion) that Rob confidently told us that the wealthy who are self made and have worked hard for their cash are not the ones who would spend money frivolously! If you can afford to spend £220 like normal folks spend £20 or less….then why not…. I just really hope that the company that makes these invests heavilly in real cleanup methods and doesnt just pocket the full amount minus miniscule production costs. (i.e. £200 per pair goes to cleaning the environment and not into the directors back pocket!). Thanks for joining the conversation – I agree we are in the premium pricing category which you’re clearly used to buying in. I answered a question above on price point and how we manufacture and run our business for anyone interested too. I have three pairs of OB Bulldog shorts! I bought three pairs of my OB swim shorts in TK Maxx for £28 each a year ago. I hope they were on the clearance rack. And @Rob good for you, and in seriousness it’s hardly as though folks with £220 to spend on swimming shorts or tshirts would be doing society a favour by instead hiding all their cash under their mattress. But it does seem a bit pointless simply spending 10x as much on stuff just cos you have 10x the money – sorta removes the point in earning it! What is an Orlebar Brown? GQ was £19 for a years sub on Black Friday, you missed your chance to get up to speed! @RussellH designer brand of swim shorts, costing £100+ a pair, but you could get them cheaper in TK Maxx. They do come with a 5-year guarantee and are good quality. If you register, OB will replace them if any stitching comes off. True, we do not do metropolitan around here. However, the Europhobes will still say that I am part of it. I have bought stuff there, but you do need to go to the metropolitan world to find the shops. I still find much of what they sell overpriced. Fortunately they seldom have my size, so I do not get tempted too much. Thanks for the comment – I fully understand our products and even price point are not right for everyone. I wanted to answer the price point question in depth so if you scroll up I have made a really, really long boring reply (sorry for the in-depth answer) I am by no means trying to convince you though. Really appreciate you being part of the conversation and sparking debate. Have a great weekend and festive period. Folks with any negative comments, please just skip on, we were told articles would crop up and they help fund the site. I will be applying and if I won I’d keep and wear the shorts, they’d be perfect for Happy Hour at the Rangali, doubt I’d want to actually go in the sea snorkelling with them though, my various pairs of Dive Uzzi $15 shorts will do the job just fine. if I see triprep/anon mention ranagli again I swear im gonna……….. Article is fine by me but swim shorts for life? Does not sound appealing. I somehow doubt many HFP readers will wear the same waist size at 20, 40 and 60. Still, 3 styles for the price of 1…baggies at 20, regular fit at 40, and skinnies to make you grandkids blush at 60. I have remained a 34 inch waist from 16 to, currently, 48 ….! At least three are proper recycled plastic. There are supposedly factories making plastic solely for the purpose of recycling it immediately as the margins are better. Which is pretty heart breaking. Great knowledge – this is a huge problem in the industry. It is devastating that it is now seen as on trend and companies are making plastic to recycle it. This will change in the future as we spend time cracking down on the issue. We use an organisation to remove plastic waste from key areas in the ocean and then ship this plastic to a sorting facility where it is cleaned and reduced down to a plastic flake. We then go through our internal fabric process to create the fabric rolls. This is then brought to the UK where we manufacture the garments. We chose to do this as we can control each element of our manufacturing and also ensure everyone is treated and paid fairly in the business journey. We are also applying to be a registered B Corp to verify our supply chain at the moment. “Up to £220” can be anything between £1 and 220, and red is not my colour. I entered my details nevertheless.